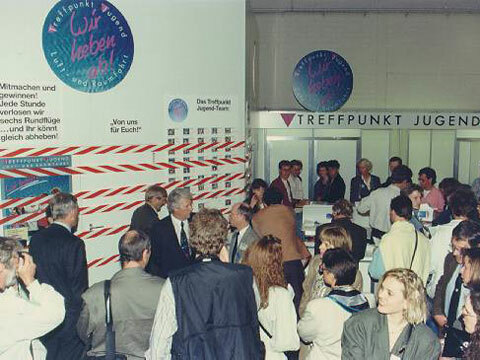 "We are taking off" is the slogan of the Careers in the Aircraft Industry booth at the International Aircraft Exhibition at Hannover, Germany in Mai 1990. 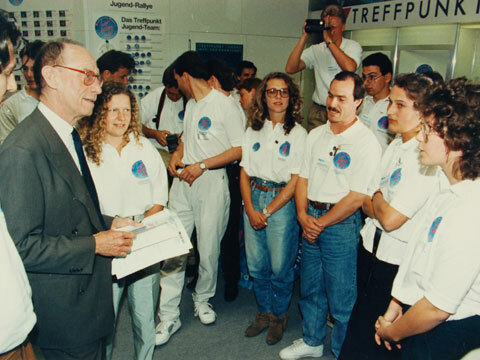 This joint youth event to promote young people to work or study in the German Aircraft and Space Industry was initiated by the German Aircraft and Space Association, based in Bonn, Germany. Project Management and organisation was in the hands of Arno A. Evers, at that time Press-Officer at the MBB (Messerschmitt-Boelkow-Blohm) headquarters in Munich, Germany. Arno founded in 1995 the Group Exhibit Hydrogen and Fuel Cells at the annual HANNOVER FAIR. Thomas Sattelberger, now member of the board of Deutsche Telekom, based in Bonn, Germany, was at that time with Management Development & Education at the former DaimlerChrysler Aerospace AG, Munich and a strong promoter of the activities at the: “Careers in the Aircraft Industry” during ILA`90. 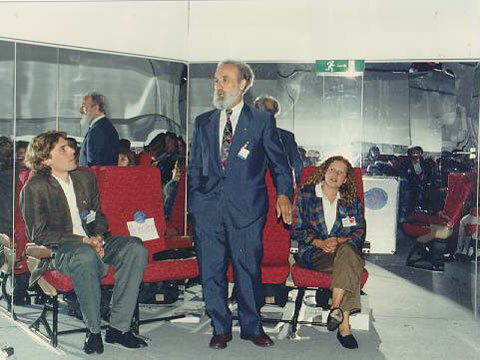 Arno A. Evers is introducing his team of moderators, from left:: Oliver Oechsle, Jürgen Prochnow and Claudia Kessler, at that time students of Aircraft- and Space Technology, at the Technical University Munich. Since 2004, Claudia is Managing Director of HE Space Operations GmbH, Bremen, Germany. 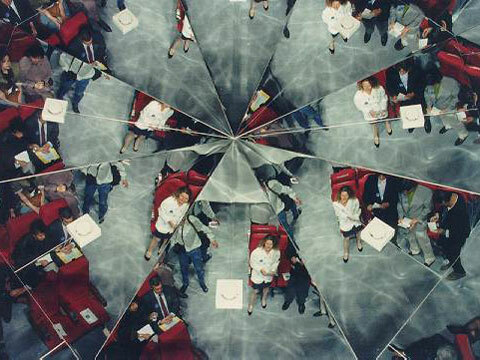 Innovative arrangement for the youth of the Aircraft Industry, a fully mirrored room, hosting 64 visitors. Alois Schwarz, chief of the workers committee of Daimler Benz Aerospace AG, in discussion with two students of Aircraft- and Space Technology. 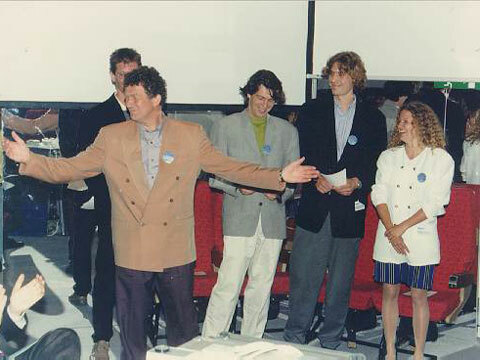 Edzard Reuter, Chairman of the board of Daimler Benz AG, talking to Ute Braam, who is now working for Exhibitions and Advertising at Liebherr-Aerospace SAS, Toulouse, France (second apprentice from left) and Jens Oellrich, (third left) who has founded his own Multimedia-AV company in Brunswick, Germany. Both are team members of the "Careers in the Aircraft Industry" – booth. 32 apprentices from nine German aircraft- and space-companies were attending. 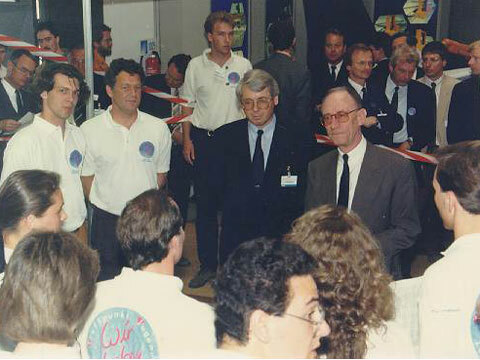 Edzard Reuter, Chairman of the board of Daimler Benz AG, talking to the staff of the "Careers in the Aircraft Industry" - stand. 32 apprentices from nine companies were attending.